Newport, NC Bojangles'® Tands, INC. Store #25 - Bojangles'® / Tands, Inc.
Craving buttery, flaky biscuits? Or maybe some spicy, crispy fried chicken? How about some refreshing Legendary Iced Tea®? If you’re nodding, it’s Bo Time! Breakfast, lunch or dinner, Bojangles’® has the delicious southern-style food you’re craving. 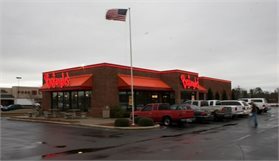 New Bern, NC customers love the fast, friendly sevice and fresh food at Bojangles’®. This New Bern, NC location is in the Food Lion shopping center off of Glenburnie Rd. We serve members of the booming residential community nearby as well as the industrial district, which includes Hatteras Yachts and Bosch Appliances. We offer Bojangles’® catering, which is perfect for both personal, social get-togethers and office meetings or parties!